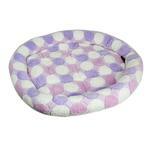 Your little cutie will love to cuddle in this Parisian Pet Cotton Candy Pet Mat in Pink! This pink mat for dogs is a must-have for any pet owners who want to make sure their pups are sleeping comfortably at night. Ideal for a smaller crate, this mat can also be used on its own. The design features a modern round shape, large polka dots, and pink and purple color tones. The soft polyester material feels great to the touch and will provide a smooth surface for pups to lie on. High quality, very practical, and a washable pet mat. Posted On 06/15/16 by Linda C from Riverside, RI Yes, Linda C recommends this product! Nice for out on porch or sun porch! Pretty and comfy!! She has the beds with the thick cushion bottoms and side walls. This is great for warmer weather and other places!! This is the first store (online or local) where I could find a big selection of dog tank tops that I wanted for my schnoodle. I'm so pleased because she gets cool with the A/C on, and a tank top is just right for her.